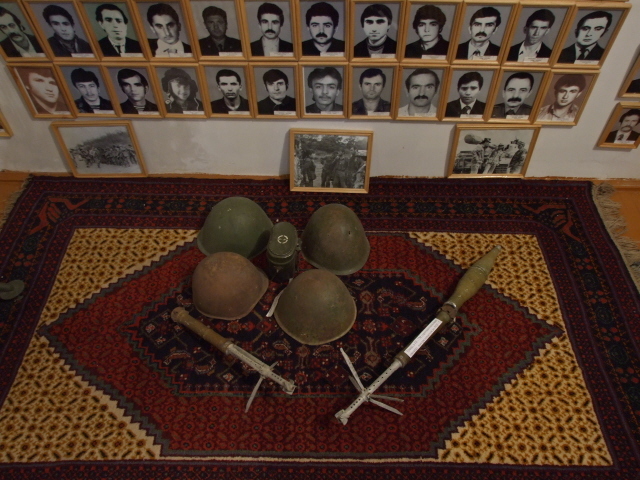 A small museum in central Stepanakert about the war in Nagorno-Karabakh. It's quite idiosyncratic, but endearing and touching – well worth a visit when travelling to this town. 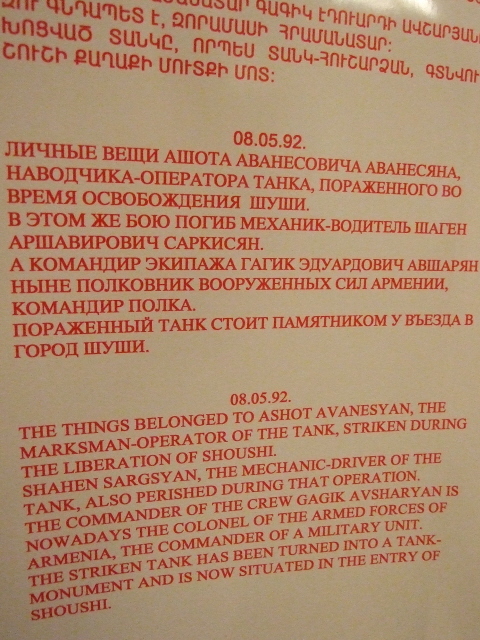 More background info: for some general info about the war see under Nagorno-Karabakh. 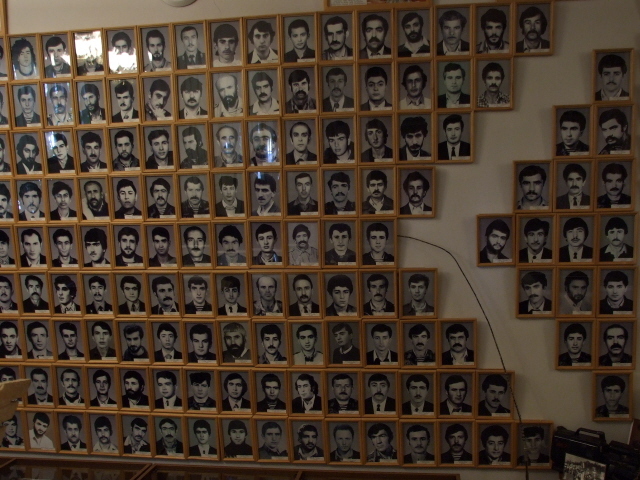 The creation of this museum has come out of the efforts of an association of the parents/mothers of fighters who lost their lives in this conflict. 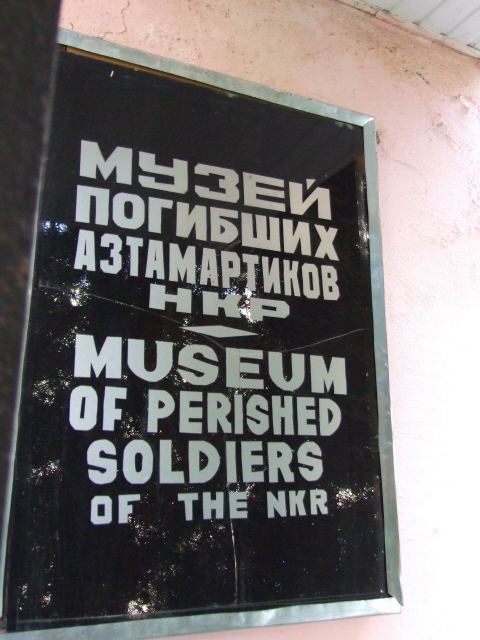 On the sign by the entrance it is referred to as the "Museum of Perished Soldiers of the NKR" (= Nagorno-Karabakh Republic). The name used in the title of this entry and elsewhere on this website is retained, however, simply because the museum is better known under that label abroad (e.g. it's the name used in the Lonely Planet guide to Georgia, Armenia and Azerbaijan). 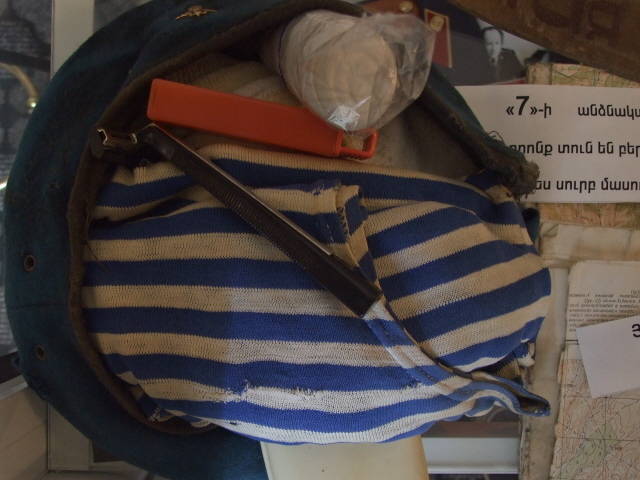 It was those mothers who, shortly after the ceasefire was in place, first started getting themselves organized and putting collected relics together, which later formed the basis of today's museum. The setting up and the running of the museum proper was, and still is, helped along through support from government institutions as well as individual "benefactors", including from the Diaspora. 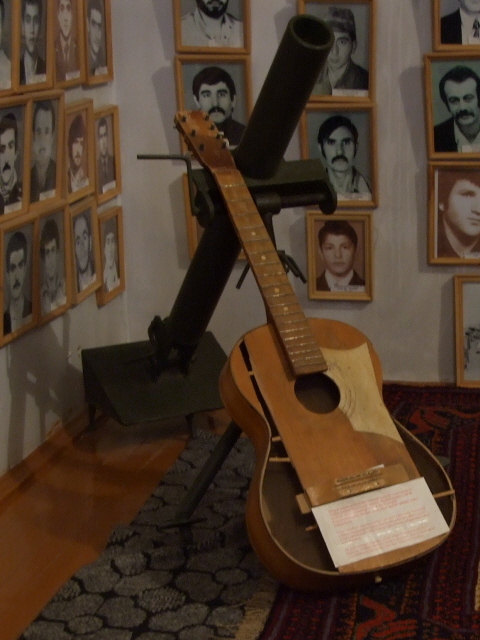 Its main aim is to pay tribute to those sons who perished in the Nagorno-Karabakh war. In that sense it's a place of worship, of pilgrimage even, especially of course for relatives and other locals. Another part of the tribute-paying is unequivocal praise for the soldiers' cause as "freedom fighters" – and of their "heroism", which should be a "model" for younger and future generations. That's the message directed at the local clientele. But obviously a museum such as this, in this kind of place, has a clear message directed at foreign visitors too. This means: don't expect anything like a sober and balanced approach here. The museum makes no attempt at presenting two sides of the story. It's just the one, and that with panache. The one-sided-ness of the approach is reflected in some intensely propagandistic language – in the labelling, the personal accounts, as well as in the museum guidebook. Sides are taken with utmost clarity: "we" are the good ones, forced into the war in order to defend our unity and our land, which is ours by birthright and has been ours since ancient times, etc., etc. – "they", i.e. the Azerbaijanis (and their allies) were the "aggressors" and had to be "booted out" in "self-defence". "They" are routinely described as "gangs" and worse, while "we", the good guys, are of course described as either innocent victims or heroic victors, depending on the battle in question. If it didn't involve so much real human tragedy, the "propagandistic" delivery of the museum's message would almost have its tragicomic aspects. For instance, any victory by the Armenian-Karabakhi forces conquering a village or town is referred to as a "liberation". The one of Shushi is naturally the most celebrated case here. The same word, though, is also applied to the Armenian seizure of Agdam. Calling that a "liberation", however, is of course way off the mark and flies in the face of not only the city's former Azeri population (IDPs since then) but also UN resolutions condemning the Armenian actions in, and the continued occupation of, Agdam. As a visitor to the museum, though, you should probably rather not bring such things up. In fact, if you go there you just have to be aware that you must leave any intentions of viewing this conflict in a neutral and balanced way at the door. You will be drawn in by the "home" side and this side's message will be delivered loud and clear. I suggest you just abandon yourself to this and take it in – but don't challenge it. After all, you are talking to mothers of perished soldiers who are trying to deal with their own personal grief in this way. Let them. You can pick up your more balanced political views on the way home if you wish. 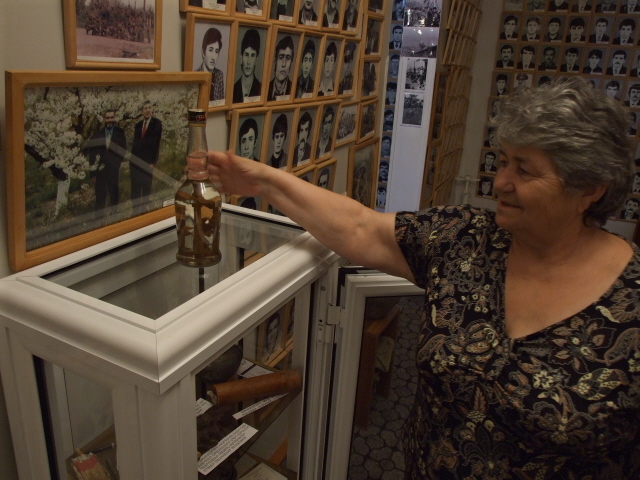 The museum is (at the time of writing at the end of 2010) still overseen by its founder and curator, Galya Arustamyan, who is also the president of the Mothers' Association behind the creation of the museum. She, and/or other associates, will be there to receive visitors in person. 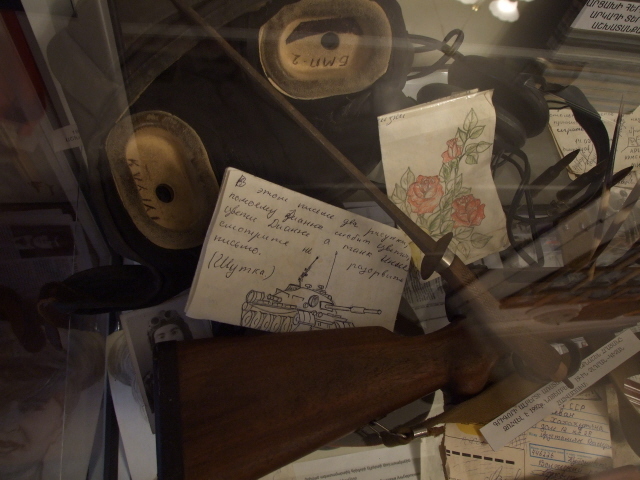 What there is to see: as you approach the museum entrance you are greeted not only by a collection of guns and home-made rocket launchers and other such military gear, but also by a couple of old ladies who welcome visitors personally. One of them is the museum's founder and curator herself. At this point the crucial question comes in: do the visitors speak any Armenian or Russian? Or will they have to rely on English? If the latter, be warned: English isn't anywhere near the usual international lingua franca here as it may be elsewhere. There is some limited labelling in English inside the museum, but it's quite a limitation if you have to rely on this (and often the translations are a bit on the cryptic side too). If, however, you have decent Russian, then you may get a personal guided tour of the museum by the curator herself (who does not speak any English). And when I say personal I really mean it – it's a "personal touch" of quite intense proportions. This became especially clear when the curator pointed out the photograph of her own perished son. That's quite a bit beyond the "normal", rather detached museum experience we are typically used to. When I visited (in August 2010) with my wife, who is a Russianist, she was able to serve as my personal interpreter, as it were, since my Russian is rather limited, to put it mildly (closer to non-existent, to be honest ... though I do know a few words it's hardly enough for following a guided tour in Russian). That way I kind of got the best of both worlds – the experience with the Russian tour as well as a good impression of what the museum has to offer those without such language skills. By and large the museum is rather visual in any case. 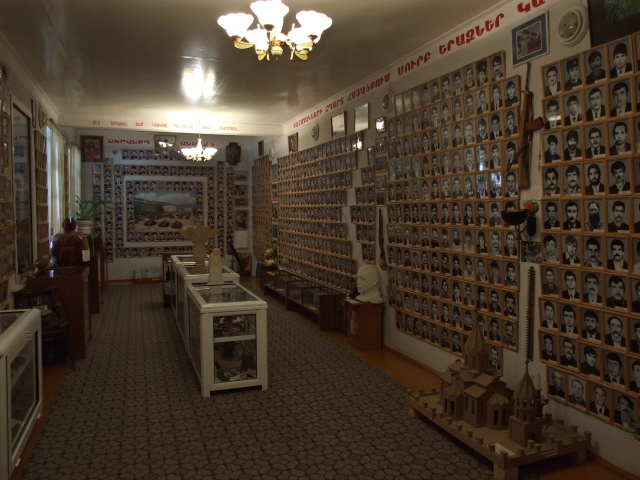 The dominating element in the museum's three rooms is: hundreds of photos (mostly black-and-white) of portraits of those perished soldiers. Their amassed motionless gaze from every wall is actually somewhat unsettling. But in a way that's the point in a shrine-like museum such as this. The photos are often arranged to form shapes – such as that of a map of Karabakh, or the stepped chevron that is the distinguishing feature in the Karabakh flag (see Stepanakert). 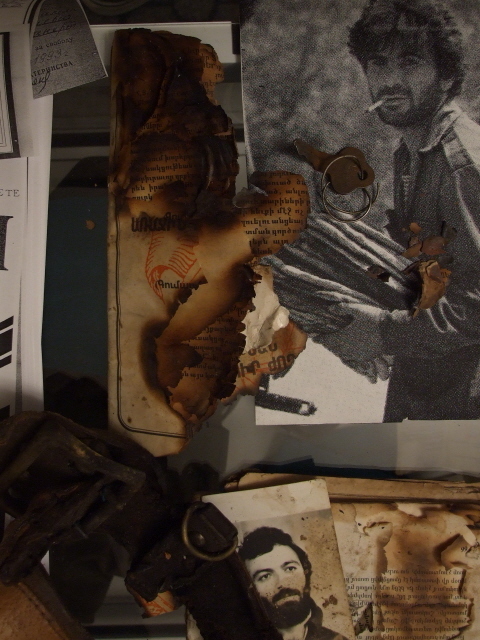 In between the photos there are objects and display cabinets full of various artefacts. 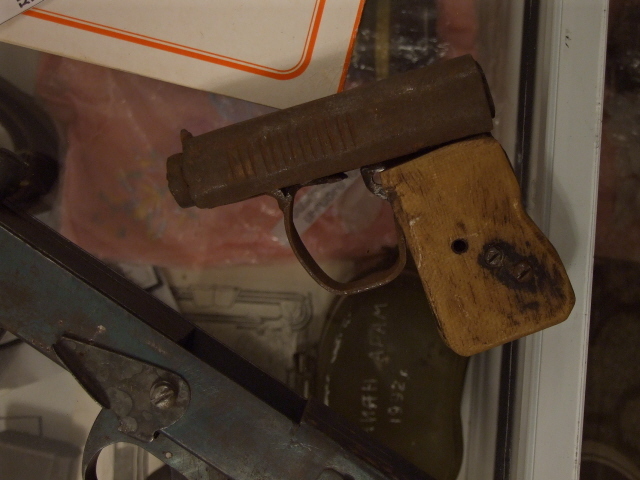 Mostly these are relics from the war, often personal belongings of soldiers, ranging from tiny things such as cigarette lighters to musical instruments. There are also busts and photos of prominent war heroes, images from the actual war, as well as of military parades celebrating the victory. 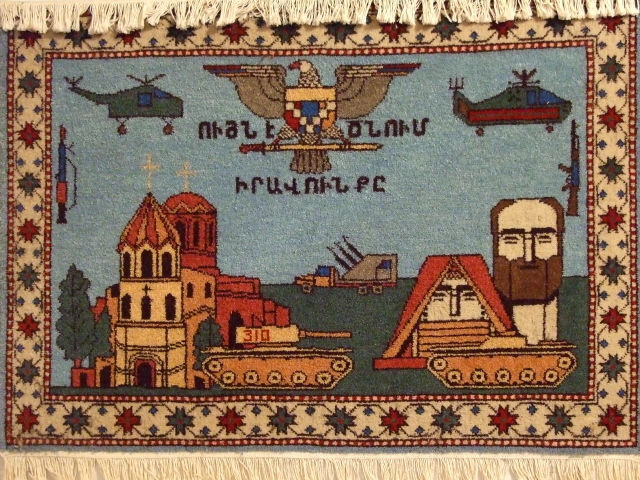 A particularly stunning piece, I found, is a tapestry of war – showing tanks, guns, and helicopters together with a typical Armenian church and the national "Papik Tatik" monument (see Nagorno-Karabakh). 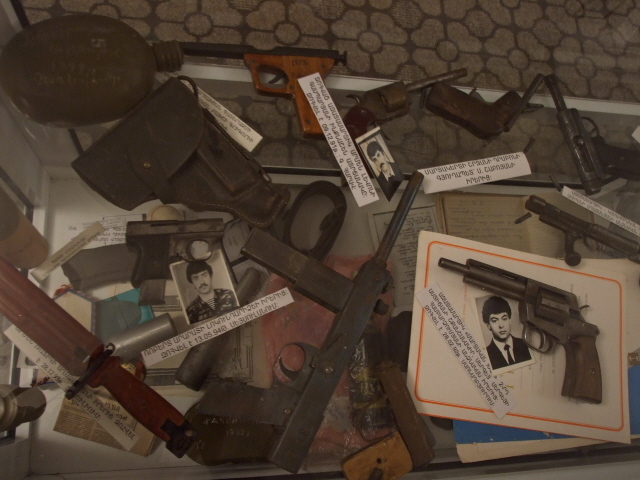 Predictably, there are also a lot of guns – including home-made pistols and crude rifles from the early days of the war, when the Armenian people of Karabakh found themselves "out-armed" by the Azerbaijani enemy, who had inherited more of the old Soviet arsenals and thus started out in the war the better equipped side. But the Karabakh freedom fighters had to improvise. 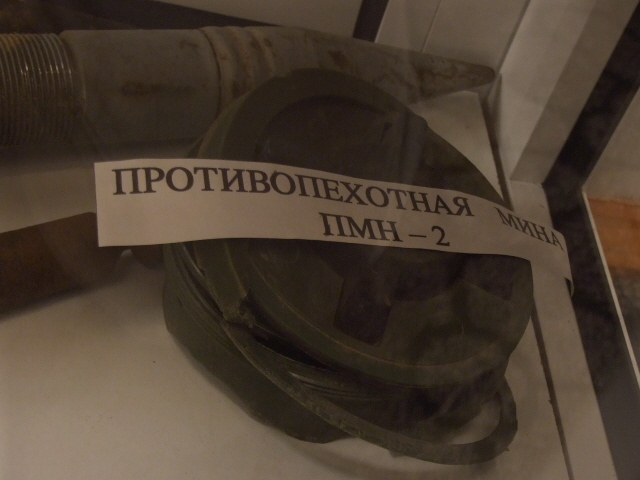 More sophisticated weapons are represented too, including mines and rocket-propelled grenades. 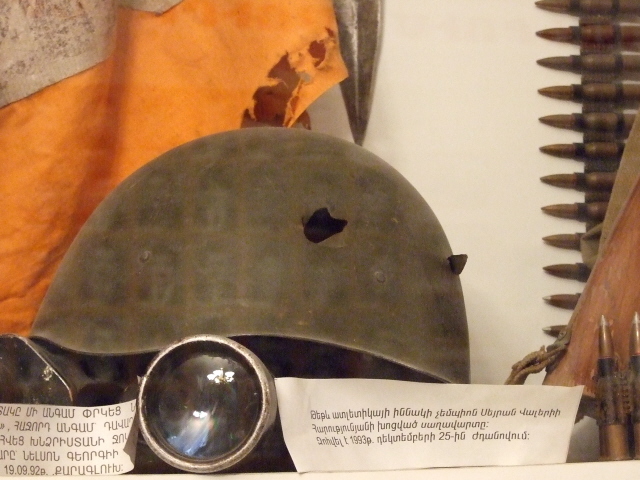 An especially dark exhibit is that of a steel helmet with two holes in it – entry and exit of the bullet that will have killed the wearer of this helmet. 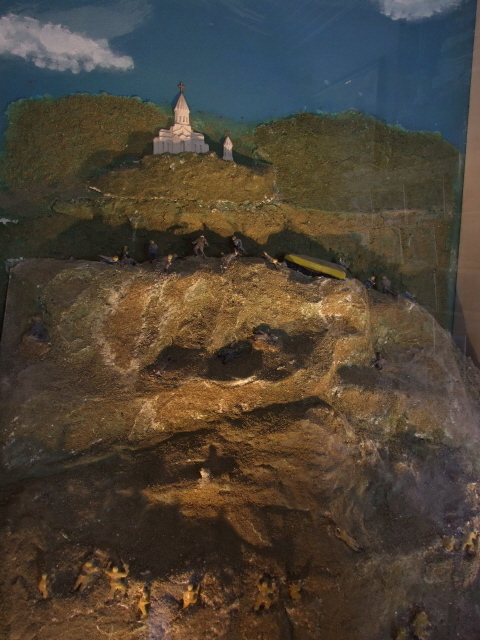 In contrast, the diorama of the celebrated battle of Shushi is rather on the endearing, even cute side. It involves toy tanks and soldiers crawling up the steep hill towards Ghazanchetsots Cathedral, the main landmark of Shushi. Unavoidably, there are also plenty of charts showing the movement of troops in various battle scenarios and suchlike. One even comes in the form of a terrain relief map of Armenia and Karabakh with little lights that flash up to indicate the location of various places. But this is as "multi-media" modern as it gets. Overall, the museum has a rather home-made, you might even say "amateurish" feel to it – but it's precisely this which makes the place quite endearing and touching. That and the authenticity of it all, of course. 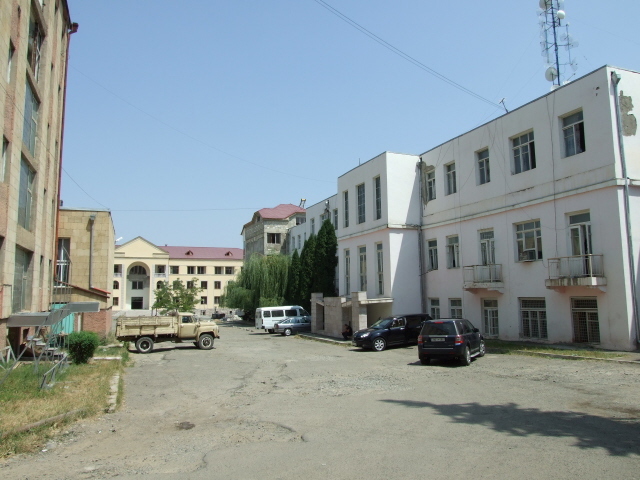 Location: near the centre of Stepanakert, Nagorno-Karabakh; the entrance is in the courtyard at the back of the large building with a faded pinkish facade on V. Sargsyan Avenue (which is also marked as Yerevanyan Ave. on some maps), between the Garegin Nzhdeh and Hakobyan side streets. Access and costs: a bit hidden, but not too difficult to find once you know where to head; free. Details: the building that the museum is housed in is easy enough to find – just a block south from the central Shahumian Hraparak roundabout on the left-hand side of the continuation of the city's main boulevard south, here called Vazgen Sarksyan Poghots (also Yerevanyan Poghots). 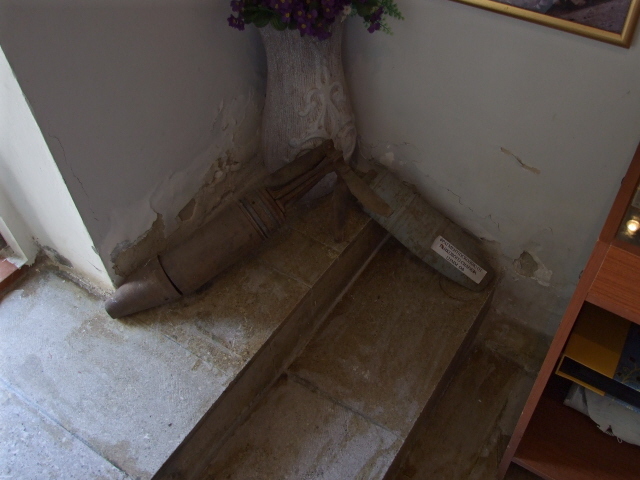 However, to get to the somewhat concealed entrance you have to walk round the building towards N Stepanyan Poghots and into the courtyard at the back. Coming from the south you'll first pass the entrance to the Museum of Missing Soldiers, which is a bit more visible, located at the back of a side wing of the main building on Hakobyan Street. 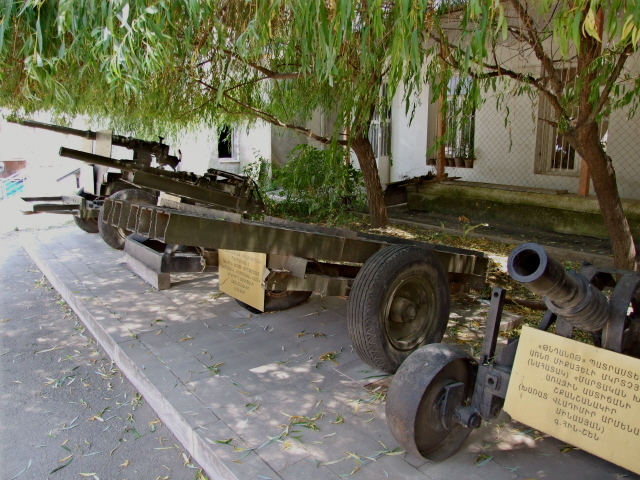 The entrance to the Museum of Fallen Soldiers, though, is in the main, central wing of the building, a bit hidden by trees, but clearly identified: there's a sign by the door – and outside are displays of a few larger armaments, such as improvised missile launchers and guns. On fine days, the curator and some associates will sit out here and chat until visitors arrive, who will be greeted and personally led inside. Opening hours: Mondays to Saturdays from 9 a.m. to 5 p.m.
Time required: depends very much on your grasp of Russian (or Armenian) – without, you may well be out again within 15 minutes or so. But if you get the curator to give you a private guided tour (not available in English), then half an hour is the minimum … it'll mainly be down to her. If you really engage with her, then you may well spend even longer here … possibly in excess of a whole hour. 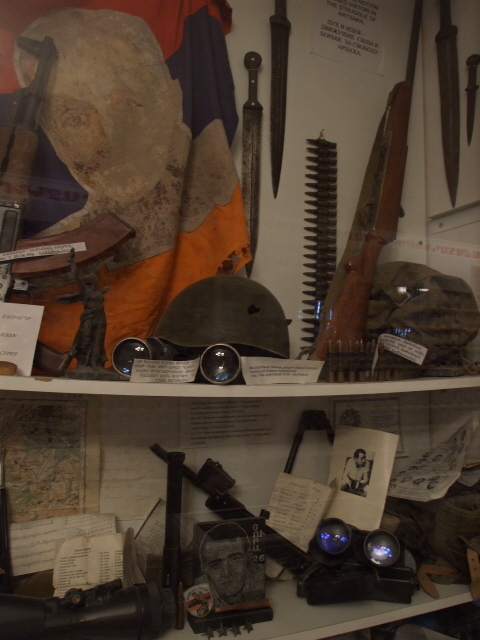 Combinations with other dark destinations: most obviously, you could follow a visit to the Museum of Fallen Soldiers with a peek in the Museum of Missing Soldiers, which is in the same courtyard, just 50 yards away. That, however, is really only worth it if you know Russian (or even Armenian) very well and are prepared for a rather intense "guidance" experience, which can be a bit overwhelming (rather than being touching and endearing, as it is at the Fallen Soldiers Museum) . 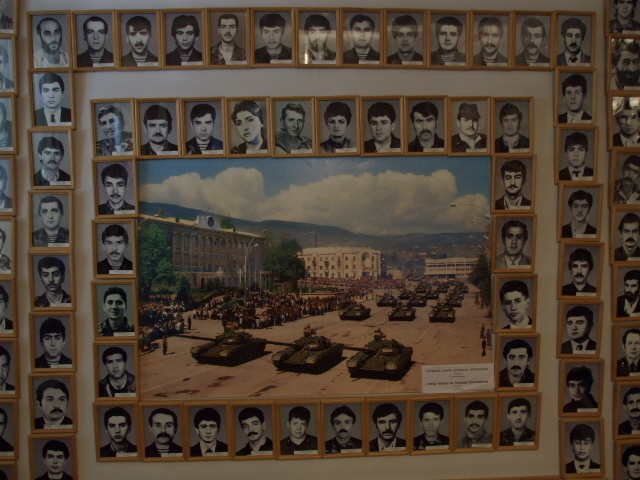 The main museum in Stepanakert, the Artsakh State Museum, on the other hand, is well attuned to foreign visitors and offers free tours in English – though it cannot compete with the Museum of Fallen Soldiers with regard to the coverage of the war and is generally much more an ordinary, old-fashioned, regional museum of typically ex-Soviet style. Combinations with non-dark destinations: see Stepanakert – the city centre is just round the corner.